The decision on whether to print an image in black and white or color can be a difficult one for designing a home. Both have their advantages and necessary place in the photography community. I would like to take a moment and discuss my feelings on the two, starting off by saying I DO NOT have the opinion that one is better than the other. I do, however, have some thoughts that one might consider before making a large print to hang on your wall. The two images above are very similar, one taken right after the other. Obviously, I chose to print one in black and white and the other in color. Before we begin, I want to mention the meaning of the two images above. These were taken at The Greenbrier moments before Dawn and her father processed. Emotion was certainly a part of the image and it is one of my favorites. 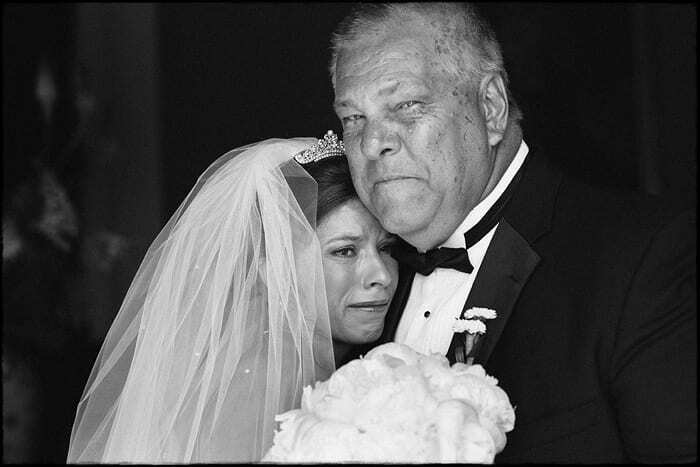 This is a unique combination of a striking portrait of Dawn’s father and a moment showing the emotion a bride feels just before the ceremony. I’m going to start my discussion with black and white. In my humble opinion, there is nothing like a monochrome image when it comes to showing human emotion and feeling. It allows the viewer to concentrate on the expression and not become distracted by bright hues within the details of the print. If you want your viewer to focus on raw feelings, I would certainly consider printing in black and white. No matter what color the walls in your home might be, a black and white image – framed appropriately – can be the classiest of displays. You may change the wall color, and because the print is monochrome, it will not clash..it will add to the color. In the color photograph above from our latest of many Greenbrier weddings, the bride’s lipstick is a shade of red and that color draws the eye more than any other color. The flowers are a brighter white and are slightly more dominant because they are closer to the camera lens. The black and white image allows for greater printing freedom to dodge and burn without altering colors in an unnatural way and keep the focus on the emotions within the image. I applied some subtle dodging and burning techniques to the both images – I just needed to have a more cautionary approach when working with colors. Let’s look at the color image and talk about its advantages. Color images in weddings are important. They allow us to reflect back and see the details of the day in their true form. Flowers, make-up, and in this image, the colors of the subjects’ eyes allow us to document a memory in color, a luxury that my great grandparents did not possess. It’s important…and I, for one, certainly will not discount that fact. I love color images and this Greenbrier wedding had some great moments that are appropriate for color printing. I partake in large format landscape photography whenever I have the chance and have enjoyed working with chrome film as much as anyone. When printing for your home, you must consider the colors in the image, where to place it, wall color, and how dominant you want the photograph in your home. Most wedding photographers I speak with rarely print images bigger than 11×14, so when printing in color, consider a subtle frame in a nice silver, black, or brown frame on a complimentary wall, a end table, shelf, or even unframed in a classic hand-made album. To summarize, both styles of printing are great. If you can’t decide, print both – one for the office and the other for your home. You will enjoy both styles for different reasons and won’t regret the decision to showcase both. Rob Garland is the owner of Rob Garland Photographers, a company which specializes in photojournalism and fine art printing. Rob prides himself on a classic, intuitive, heartfelt documentation with the utmost in visual integrity. He has documented many destination weddings throughout the U.S. and abroad as well as Charlottesville weddings at many of our outstanding local venues. 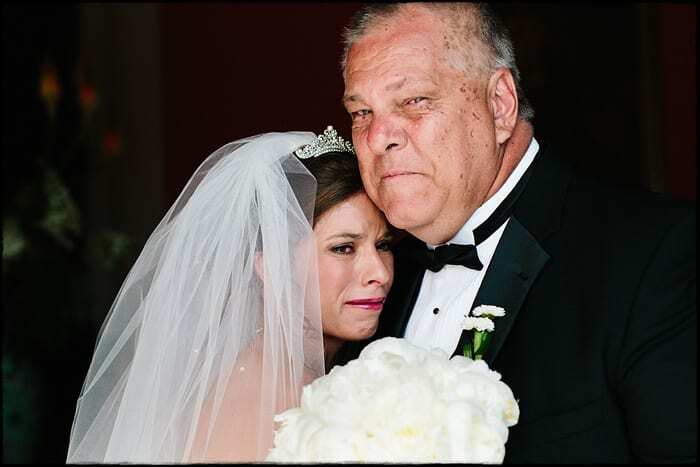 He continues to document Greenbrier weddings and prepares his team with an unobtrusive, classy approach to each wedding, allowing for a photographic approach that will provide enjoyment for years to come. Rob loves imagery that fails to go in and out of style and personal touches that make each wedding unique.